Growth potential in the Service function too often remains underutilized today. In optimizing your Service function we secure above average margins and provide profit stability for your company. Competition in the volatile new equipment business is becoming more and more intense and depresses margins. Globally active customers demand comprehensive and global Service support. In addition, Service generates high profitability independent from market cycles, and customer satisfaction is significantly increased. Service too often is reactive. Only a few companies recognize the market potential of their Service business. The costs of value performance are seldom as scrutinized as for new products. Above all, however, customer requirements are not fully understood or even actively controlled. What is lacking is the focus by the Sales organization on the customer with all eployees being responsible. Optimization of the Service function offers especially high potentials. First our TARGUS team consisting of industry and consulting experts analyzes the performance of your Service’ value performance. 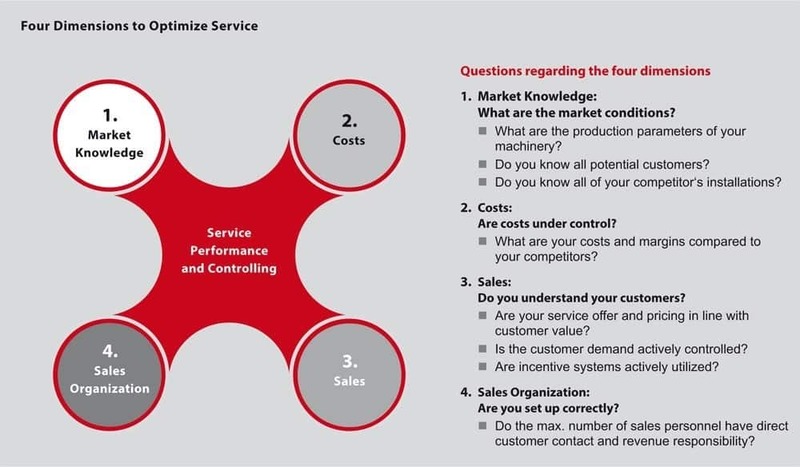 All four dimensions of your Service business are examined in detail, for hidden weaknesses or to evaluate if your Service function is competitive. The unrealized margin potential is weighed towards developing individually tailored solutions for your situation. First your Service key data is examined in order to evaluate performance as well as Service quality and Service controlling. If the basis covers the value performance of customer requirements, then your market knowledge about competitors, customers and operational conditions of your facilities are examined. Building on that information your value performance costs are carefully examined. Only those who perform most economically can derive the necessary profits. One of the greatest levers is often found on the sales/marketing side. One must understand the customer in detail in order to align one’s Service offer with customer requirements and exhaust its full profit potential. Frequent on-site visits at customer’s plants help identify their requirements and how to best serve them. That allows you to bring pricing in line with customer value. In order to sell its optimized Service offer, the entire Service sales organization must be customer focused. TARGUS has extensive Expertise in Operational Excellence in value performance, in purchasing external value creation and in the improvement of operating sales performance. Building on these core competencies you profit from the comprehensive consulting and industry experience of our experts in the design and implementation of a powerful Service concept. The systematic optimization of the Service business opened up new sales opportunities, significantly decreased the costs of goods and services and implemented a new pricing system. Sales are increased by more than 20% and the profit margin is on its way to being doubled. With the goal-oriented support of TARGUS the Service business was reworked in only 4 months and an intermediate action plan with detailed measures was developed. The positive results appeared quickly in the company’s earnings.